Songs of Deliverance is the latest book release by Marilynn Griffith. Within the novel, Griffith weaves together the stories of four childhood friends, torn apart by the mistakes and tragedies of their past. Now as adults, they are reunited in their hometown of Testimony, Ohio, where they sort through the messy, real-life struggles of secrets kept hidden, lost loves and unknown futures. The book features Zeely Wilkins - the one with the beautiful voice that earned her the nickname “Birdie,” when she was younger. Now engaged to marry Jerry, her life seems to be back on track, though she struggles to bury feelings for her high school sweetheart. Grace Okoye - who can make you hold your breath when she dances, but ever since that night more than a decade ago, she has pushed that dream—like so many others—aside. The book focuses on how the friends began to help and encourage each other as they address the pains, heartaches and tragedies of their past—and get a second chance to make things right. Though never easy, the friends experience a spiritual awakening as they begin to face their secrets and sorrows and offer their struggles over to God. They learn the beauty and strength in friendship, and the inexhaustible depth of God’s healing grace and redemption—no matter how hopeless or doomed things may seem at first. First off, I liked the book in general. I thought Griffith wove the stories of four friends together in an interesting way. I also thought she kept the novel moving quickly, as things began to unfold in the lives of her main characters - Ron and Zeely. The book is a sequel - to Rhythm of Grace (see below for info about this book), but billed as a "stand alone" novel. Honestly, I think that billing is a disservice to the reader, and to Griffith. I spent the first half of the book trying to figure out what was happening. The story jumps so quickly, that if you didn't read the first book, it was like coming into a play in the second act. I assume (haven't picked up the first book) that the first book lays the ground work so you can appreciate the direction, rhythm and flow of Songs of Deliverance. With that said, I loved Griffith's description of worship - although, I'm not sure I've ever encountered a service with so much emotion and feeling. I also love how she describes the feelings and interactions between Grace and Brian and Zeely and Ron. But, because I "jumped" into the story in the second book, I spent way too much time trying to figure things out, and understand why things were happening. Even now, as I reflect on the book, some questions are still unanswered, because the foundational elements were in her first novel. I truly think, in order to enjoy this novel, you should take the time to first pick up Rhythms of Grace. Only then will you truly find the deliverance Griffith writes about - and appreciate the journey of faith the four characters take in the final manuscript. I am pleased that this book came across my desk. It's introduced me to a strong, Christian writer. I look forward to seeing what Griffith comes up with next. Marilynn Griffith is a freelance writer and conference speaker whose online columns and blogs reach thousands of women each year. She is the author of the Shades of Style series. Marilynn lives in Tallahassee, Florida, with her husband and their seven children. Read more about Griffith by visiting her blog: www.marilynngriffith.typepad.com. Find all of Griffith's books at Amazon. Grace Okoye was a promising young dancer when her career was cut short by a brutal assault that left her scarred for life. Twenty years later, when her past gets in the way of her happiness, she heeds the invitation of her dance instructor and returns home to help hurting children and rediscover the rhythms of grace. The result of an unexpected snow day? brain in between make overs. I use for the header & labels). Mandy & Drew Harris, and Alex and Emma Harris. Editor's Note: This article was previously published as a Lifestyle feature, page 7, in the 1/27/2010 issue of the Siloam Springs Herald Leader. Read it online here. SILOAM SPRINGS — Two Siloam Springs girls are learning this week that sometimes, wishes really do come true. Alex and Emma Harris, along with their parents, Drew and Mandy, left Sunday for a 12-day trip to Florida, thanks to the Make-A-Wish Foundation of the Mid South. The girls are receiving two separate, but complimentary wishes, through the foundation. Emma wished to meet Mickey Mouse, while Alex asked to swim with dolphins. For Emma’s trip, the family will stay at “Give Kids the World Village,” and receive passes to the Magic Kingdom, Epcot, MGM Studios, Universal Studios, Animal Kingdom and Sea World. During Alex’s wish, the family will stay at the Renaissance Resort. Alex will get to swim with dolphins at Discovery Cove and receive a VIP tour of SeaWorld, as well as spend more time at the Disney parks. Drew, a staff sergeant in the U.S. Army, currently deployed stateside at Ft. Sill, Okla., was given leave by the military for the trip. It was Drew, who first contacted Make-A-Wish, after his girls were diagnosed last year with Pantothenate Kinase-Associated Neurodegeneration or PKAN, a rare genetic disorder that allows for the accumulation of iron in a person’s brain. PKAN causes the girls to exhibit many of the symptoms similar to Parkinson’s disease, including a rigidity of muscles, tremors and a lack of coordination. It also affects a person’s cognitive and developmental abilities. One to three individuals for every one million births are diagnosed with PKAN. 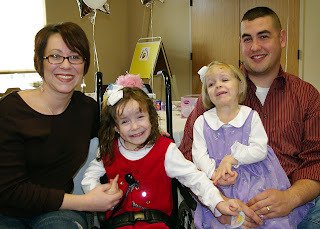 Alex and Emma are the first diagnosed cases of the disease at Children’s Mercy in Kansas City. Most people with PKAN only live into their 20s or 30s. Individuals, like Alex, who present symptoms early in life, often progress with the disease at a faster rate. “We wanted to do all we could while we were able, and they could enjoy it,” Mandy Harris said. When volunteer “wish granters” from Make a Wish came to discuss possible wishes with the girls, Harris said she initially thought it would be one wish, for both girls. Initially, Harris joked, 4-year-old Emma wanted to “go shopping.” Later, she said she wanted to “see Mickey Mouse” and be a princess. Harris thought Alex would want to meet Hannah Montana, but the 7-year-old asked to “go swimming with dolphins,” because she wants to give a dolphin a kiss. Alex also wants to see Cinderella and give Goofy a hug. Because crowds sometimes overwhelm Alex, who now spends most of her time away from home in a wheelchair, Harris said the Make-A-Wish volunteers planned the trip for January - a slow season in Orlando. The Harris’ hopes the trip will allow their daughters to feel “special” for a good reason and take a break from the worries of therapy, medical treatment, daddy being in the Army and life in general. “They will get to do fun things just because they are Alex and Emma,” Harris said. Harris said they knew that something was different about Alex, from the moment of her birth. Initially, doctors at Arkansas Children’s Hospital suspected Alex was not hitting normal childhood milestones because she was born with clubbed feet and hip dysplasia. Doctors believed she would begin to develop normally once corrective surgery was completed. The possible diagnosis of an unknown, but genetic disease came when Alex was 24 months old. At that time, Mandy was 6-months pregnant with Emma. Initially, doctors thought Emma was disease free, but after a year, she began to develop symptoms similar to her sister. When Alex was 4-1/2, the Harris’ decided it was time for a medical “fresh start” and made an appointment for Alex with doctors at Children’s Mercy in Kansas City. For two years, doctors continued testing Alex, trying to determine what disease caused her symptoms. In February 2009, Alex’s case was referred to Dr. Jean-Baptiste Le Pichon, a child neurology specialist at Children’s Mercy. After extensive testing, which again, ruled out all basic genetic diseases, a new MRI revealed an accumulation of iron in Alex’s brain. Those tests were sent for further examination, which led to the diagnosis of PKAN. Emma, although her symptoms are not as severe as Alex, exhibits the same iron patterns in her brain and has been diagnosed with PKAN as well. A self-defined “information junkie,” Harris limits what she reads online about PKAN, for her own mental well-being. The Harris’ are striving to raise Alex and Emma like two, regular little girls, who like pizza, the colors pink (Emma) and purple (Alex) and ask to eat at Chili’s restaurant. The girls receive occupation, physical and speech therapy three days a week at Friendship Pediatric Clinic in Siloam Springs. After the diagnosis, the Harris’ met with a developmental child psychologist after the diagnosis, to help chart a future for her girls. The psychologist encouraged them to develop a list of things they wished to experience and make memories with their girls, to maintain a functioning, quality of life. Home schooling has allowed Harris to tailor her daughters’ learning experiences to their physical, developmental and cognitive ages, rather than chronological ages, 7 and 4-1/2. Harris said participation in the children’s ministry at Elm Springs United Methodist Church, in Elm Springs, Ark., provides her daughter with a social outlet and a network of friends. Drew Harris will finish his second deployment since Alex was born in April. His first deployment, when Alex was an infant, was to Iraq. With 11 years of service behind him and retirement less than 10 years away, Harris most likely will re-enlist for reserve duty. The Harris’ will take a future deployment as it comes. “There’s no guarantee with life,” Harris said. “We just happen to know our [years] are shorter than most, so we’re enjoying the time we have. According to information released by the Mid-South Foundation, the Make-A-Wish mission is about the life-affirming, hope-giving aspects of the wish experience. The words “terminal” or dying” are never used to refer to a wish child, nor do they emphasis a child’s illness, medical treatment or death. Alex and Emma Harris’ wishes are among the 275 that the Mid-South Foundation plans to grant this year. One of 65 chapters across the United States, the Mid-South group generally follows a fourstep process when granting a wish. Children, between the ages of 2-1/2 and 18, who have not had a wish granted by another organization, are eligible for a wish. Medical personnel, parents or even a child can make a referral to Make-A-Wish. Once the child’s acting physician helps determine medical eligibility - a life-threatening medical condition - the child (and his/her family) meets with volunteer Wish Granters. The Wish Granters help identify and create the child’s wish. Wishes typically fall into four categories: to go (on a trip), to meet (a famous person), to be (a job/person) and to have (an item). The average cost of a wish is $7,100. 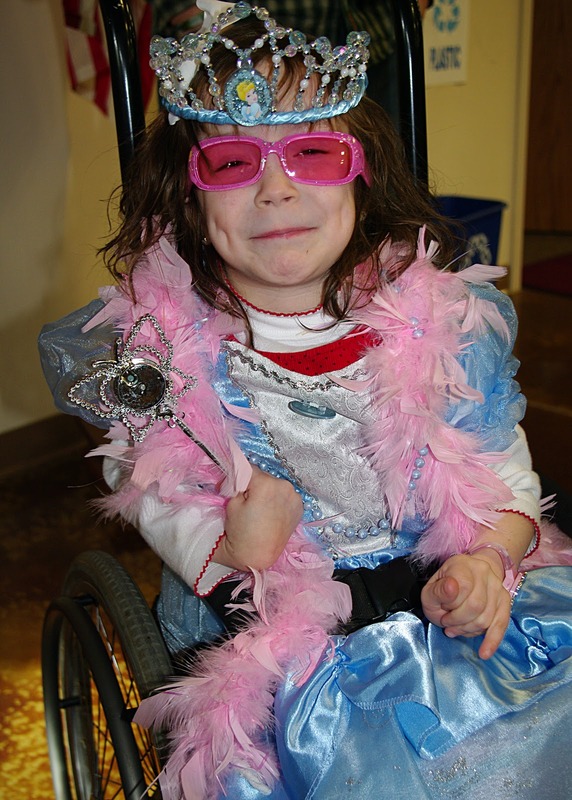 Seventy-eight cents of every dollar donated is allocated to wish-granting. 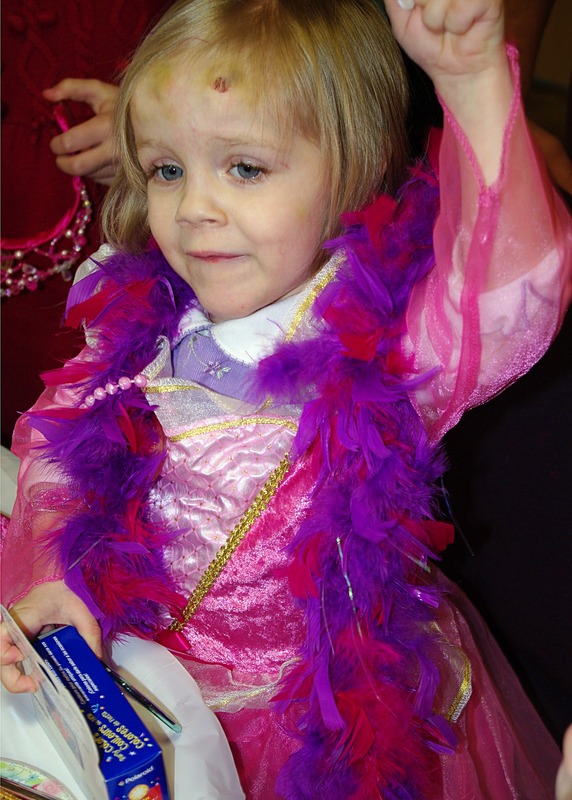 Cash and in-kind contributions helps grant additional wishes. During the wish, the Foundation covers all expenses, to give the wish kid and family a respite from the stress of dealing with the life-threatening medical condition. For more information, call (501) 376-9474. So, since the section isn't on-line, I thought I'd record my 20 questions here....enjoy! 1) What is your occupation? Minister to families with children – basically, I coordinate the children’s ministry for First United Methodist Church in Siloam Springs. 2) What was your first car? A Pontiac T-1000. A small tiny car that looked like a grey roller skate. 3) Which talent do you wish you possessed? To speak another language – especially Spanish. 4) Are you a collector of anything? Books. I also have quite a collection of movie soundtracks on my iPod. 5) If you were given $1 million, what would you spend it on? I would pay off all of my seminary loans and my other outstanding bills, so I could live debt free. I would then set up a college scholarship for my niece and nephew. After that, I’d find ways to use my time and talents to help other people. I’d also travel to Ghana to see friends who are missionaries. 6) What is one thing not many people know about you? Hum. My life is pretty transparent. That I want to make a significant difference in the lives that I touch. Oh, and that I’ve started designing digital scrapbooking elements and papers with Sue Cummings under the pen name "kaytebug." Our first kit debut at Christmas time at Oscraps.com. 7) Favorite song of all time? 8) What bad habit drives you crazy? Um…my own or someone elses? That I am not the best housekeeper in the world. 9) If you could have any superpower, what would it be? The ability to add hours to a day. I never seem to get anything finished. Ah, Conan. Leno just needs to step aside. He’s had his turn in the spotlight. He needs to let someone else shine for a while. 11) What's your dream job? To become an amazing photographer like Annie Leibovitz or to write a novel like my friend, Hannah Alexander. 12) Most memorable Christmas present? The “aggies” jacket my parents bought me my freshman year of high school. I wore it out. Although the iPhone they surprised me with this year is pretty cool. 13) Who is your role model? Anyone who lives an authentic life. Autobots all the way. You have to choose the good guys side. 15) If you had one day to live, what would you do? Spend it with someone I love. 16) Do you keep food separated on your plate or all mixed together? My food can touch. Really, it’s ok if it does. 17) What is your favorite breakfast cereal? 18) Can you play a musical instrument? If so, which one? Not anymore. But I played the clarinet in school. 19) Do you sing in the shower? What's your favorite song? 20) If you were stranded on an island, which CD would you want in your CD player? Um...who has a cd player anymore??? Anything by Steven Curtis Chapman or Chris Tomlin. Take a nap, redecorate your home, become a mentor. Those are three of the things authors David B. Biebel and James and Bobbie Dill, recommend a person can do to “feel great” today and beat stress. In their new book, 50 Ways to Feel Great Today, the writing trio offers medical and spiritual advice regarding 50 things anyone can do to brighten their mood. They include scientific research, scriptural references and real-life anecdotes, to help a person approach mental health and well-being from an emotional, spiritual and physical perspective. Their suggestions offer readers with a chance to find a way to “pick” themselves up, without overwhelming them with lots of things to do. I found the suggestions easy to grasp, and in many cases, easy to implement into your life. In fact, one idea “kidnap someone you love” seemed quite fun and adventurous. (Basically, you plan either a weekend get-a-way, or an afternoon adventure for someone you love – aka. a spouse, sibling, family member or close friend – and plan all of the details so they don’t have to worry about it. Then surprise them with the adventure in an unexpected way. In all, while many of the suggestions in the book are not unique, the authors have woven together 50 helpful ideas that will remind people, male or female alike, to step back and take care of themselves. Who knows, you might just find yourself flying a kite, if you take one of their ideas to heart. Revell, a division of Baker Publishing Group, offers practical books that bring the Christian faith to everyday life. They publish resources from a variety of well-known brands and authors, including their partnership with MOPS (Mothers of Preschoolers) and Hungry Planet. For more info, vist: www.RevellBooks.com. Callahan Crossing had changed some while he'd been gone. But then, so had he. A man couldn't fight for his country and not be affected by it. With those opening lines, Sharon Gillenwater introduces readers to the first book in her newest series, The Callahans of Texas, which centers upon the lives of siblings Jenna, Will and Chase. Set in a small Texas town filled with ranching, farming, football, patriotism, community, friends, family, God and country, The Callahans of Texas also contain themes of heartache, healing, faith, laughter and love. The first book in the series, Jenna’s Cowboy, opens with Nate Langley’s return to Callahan Crossing after serving in Iraq in the armed forces. In the novel, Nate comes home from the war seeking peace and a normal life – only to be plagued by Post Traumatic Stress Disorder or PTSD. Gillenwater said she enjoyed developing Nate’s character. In fact, she thinks his character is what sets the book apart from others. “I love to write about the people of West Texas, usually with heroes who are cowboys or lawmen,” she said. “I've never done a book where the hero is in love with the boss' daughter and thought that might add a little fun to the story. This is the first time Gillenwater has made one of her main characters a returning veteran. “I've read about many veterans from Iraq and Afghanistan who are dealing with Post Traumatic Stress Disorder, and my heart goes out to them,” she said. “I wanted to make people more aware of PTSD and how it affects not only the person returning from war, but family and friends as well. In fact, Gillenwater knows first hand some of the struggles faced by Nate. Her husband returned home from serving in Vietnam with PTSD. For the most part, Gillenwater used her personal experiences to craft the characters Dub and Sue, Jenna’s parents. Dub, a Vietnam veteran, also experienced PTSD. It’s only when Nate begins to exhibit the issues, does he share the diagnosis with his three children. In the Jenna's Cowboy, Sue tells her children about a time when their father began to have a nightmare and kicked her out of the bed. While not a real location, Callahan’s Crossing is a combination of many small, West Texas towns, explained Gillenwater, admitting that much of the landscape and terrain around and south of Colorado City, Texas – her hometown – influenced the setting. Gillenwater hopes readers take several messages away, once they finish reading Jenna’s Cowboy. The Callahans of Texas will be a three-book series, with each sibling taking center stage in a novel. Gillenwater developed the series after Andrea Doering at Revell asked her to submit a proposal with a contemporary Texas setting. The second book, Emily’s Chance, is set to release in September 2010. In it, Chance has to convince Emily, whom he met in the first book, that marrying him and living in Callahan Crossing is more important than her five-year plan to get a job at a big city museum. Or he has to decide if he is willing to leave his small town and move to the big city with her. The third and final book, set for a 201l release, is Will’s story. When he meets Savannah, she is homeless, broke, pregnant and unmarried. Will's challenge is to convince her that he doesn't care about her past—only their future. Gillenwater describes herself as a wife, mother and grandmother of two delightful children. "[I'm] a country girl who finally moved back to the country after living in the city for thirty years," Gillenwater said. "I love Jesus and am blessed that I can serve God through the stories He gives me. After twenty-two years at this writing gig, I'm still amazed that someone actually publishes them and people read and enjoy them!" Gillenwater started writing after lecturing a friend, leaving for college, not to wait until she was in her 30s to decide what she wanted to do with her life. "She astutely turned the tables and asked me what I wanted to do," Gillenwater said. "Without thinking, I blurted, 'I want to write.' Once the words were out in the daylight, there was no turning back. With my husband's encouragement, I followed my dream, which took a while—almost four years to sell my first book." Since she started writing, Gillenwater said God has used it to draw her closer, and to give her more wisdom in some areas. "His opening up the door with Revell has been amazing," she explained. "He literally handed me the opportunity out of the blue." She said the birth of a new granddaughter, last October, also add to the excitement in her life. "My husband just retired, so it's interesting to have him home a lot more," she said. "[It's] nice to have someone to talk to during the day besides the dog. It's fun to see him finally have a chance to relax and spend even more time in the Scriptures." She encourages her readers to lean on Jesus and find their trust in Him. "God knows what is best for us even when it doesn't exactly line up with our thinking!" she continued. I really enjoyed Jenna's Cowboy. I immediately fell in love with the town, the characters and Gillenwater's colorful descriptions of life on a West Texas ranch. I thought the struggles she gave Nate were authentic and well written. As a friend whose husband is in the military once said, Army life is not a "drama." It's not a Lifetime movie special. Nate's struggle with PTSD, and the other characters reaction to it, seemed genuine. I found Jenna's struggle to piece her life back together, after being (not quite literally) kicked in the teeth by her "football star" ex-husband an honest portrayal of how a woman can literally pull herself up from the bottom of a pit, thorugh the help of family and faith. Gillenwater's characters are real. They aren't full of saccharine. They could be the guy or gal next door. One of my favorite scenes: the homecoming parade that takes place shortly after Nate returns home. Thanks to the "small town" grapevine, everyone finds ways to show that they care for Nate - through business marquees and other statements. He is welcomed home, in the truest sense, not just because he's a returning veteran, but because everyone cares for him. Callahan's Crossing, as a town, shows off small-town Americana at its best. Jenna's Cowboy is a good read. Don't be surprised if you find yourself staying up late to finish it. Find Jenna's Cowboy online at Amazon.com.Jenna's Cowboy is also available through most regular and Christian bookstores, some Walmart stores, and Christian Book Distributors catalog or online. Looking for other books by Gillenwater? While many are out of print, you can find them on-line through Amazon.com. 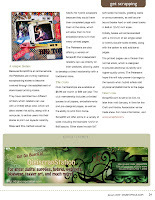 Editor's Note: The following article was published in the January 2010 issue of DST Insider, a publication of DigiShopTalk.com. 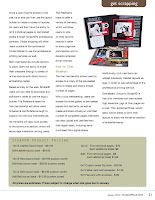 With the launch of ScrapHD.com, siblings Ross and Katy Petersen hope digital and hybrid scrapbookers alike will find an Internet home to not only expand their craft on the Web, but also expose them to a variety of “brick and mortar” retailers through an on-site printing option. 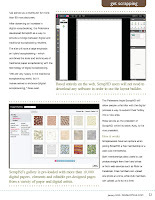 ScrapHD, set to launch this month, includes an on-line layout builder – with an interface similar to Photoshop - along with a collection of more than 10,000 digital papers, elements and editable pre-designed pages from a variety of paper and digital artists. Some of the items within the pre-loaded gallery include items from retired product lines, while others will be completely new offerings. Paper companies represented on the site includes: 7gypsies, Mrs Grossmans, American Crafts, Piggy Tales, SEI, imaginisce, Art Gone Wild, Teresa Collins, My Minds Eye, Three Bugs In A Rug, Karen Foster Designs, Kaiser Craft, We Are Memory Keepers and Jenni Bowlin Studio. Digital artists joining the ScrapHD design team includes: Danielle Young (A Cherry On Top, Oscraps), Amy Teets (A Cherry On Top, Scrap Wow), Laura Burger (Digital Scrapbook Pages, A Cherry On Top, Gotta Pixel), Kelly Shults (A Cherry On Top) and Donna Salazar. Adds Katy, “our vision is to promote and enhance the scrapbooking industry by being the most intuitive and technology advanced digital/hybrid scrapbooking site on the web"
ScrapHD grew out of a paper crafting distribution company owned by the Petersen family. For approximately 12 years, the family-run company has served as a distributor for more than 90 manufacturers. After observing an increase in digital scrapbooking, the Petersens developed ScrapHD as a way to provide a “bridge” between digital and traditional scrapbooking retailers. The site will have a large emphasis on hybrid scrapbooking – which combines the tools and techniques of traditional paper scrapbooking with the technology of digital scrapbooking. “We are very happy in the traditional scrapbooking world, but it makes sense to embrace [digital scrapbooking],” Ross said. The Petersens hope ScrapHD will allow people unfamiliar with the digital process a way to expand their hobby into a new area. Ross serves as the president of ScrapHD, while his sister, Katy, is the vice president. 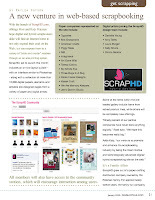 Scrapbookers have two options when joining ScrapHD: a free membership or a paid club membership. Both memberships allow users to use photos straight from their hard drives or from web services such as Flickr or Facebook. Free members can upload one photo at a time, while club members can upload up to six at a time. Once a user imports photos to the site, he or she can then use the layout builder to create a variety of layouts. All users will then have the ability to print individual pages or completed books through ScrapHD’s professional partners. Global shipping will allow users outside of the continental United States to use the professional printing services. Both memberships include options to allow users the ability to share their creations through a variety of online sources through direct links or embedding codes. Based entirely on the web, ScrapHD users will not need to download any software in order to use the layout builder. The Petersens hope the free membership will allow users to become comfortable enough to expand into the club memberships. All members will also have access to the community section, which will encourage interaction among users. The Petersens hope to offer a variety of contests, which will allow users to vote on their favorite layouts in order to encourage site participation and to develop scrapper-driven themes. The free membership allows users to access to a many of the pre-loaded items to create and store a limited number of pages. With a club membership, users can access the entire gallery of pre-loaded papers and elements, as well as create and store “virtually” an unlimited number of completed pages. Members can also upload and use files from their digital stash, including items purchased from digital stores. Additionally, club members can upload previously created layouts, as jpgs, in order to take advantage of the professional printing service. One aspect unique to ScrapHD, is that club members can also access high resolution jpgs of their pages via e-mail. This, explained Ross, would allow hybrid artists to print their layouts to allow the “hands on” addition of embellishments. Because ScrapHD is an online service, the Petersens are inviting traditional scrapbooking stores to become involved through the establishment of store-based printing kiosks. They have identified four different printers, which retailers can use, with a limited setup cost, which will allow stores the ability, along with a computer, to entice users into their stores to print out layouts instantly. Ross said this method would be helpful for hybrid scrappers, because they would have their completed page with them at the store, which will allow them to find embellishments to their newly printed pages. The Petersens are also offering a version of ScrapHD that independent retailers can use directly on their websites, allowing users to develop a direct relationship with a traditional store. Club memberships are available at $9.99 per month or $99 per year. The club membership includes unlimited access to all papers, embellishments and pre-designed pages, as well as the ability to print from home. ScrapHD will offer prints in a variety of sizes including the standard 12x12 or 8x8 layouts. Other sizes include 5x7 soft sided flip books, greeting cards or announcements, as well as pre-bound books hard or soft cover books in 8x8 or 12x12 inch sizes. Initially, books will come standard with a minimum of 10 single-sided or 20 double-sided sheets, along with the option to add additional pages. The printed pages use a thicker than normal stock, which is designed to provide additional durability and higher quality prints. The Petersens hope this will help prevent damage to the layouts when hybrid artists add physical embellishments to the page. Editor's note: ScrapHD.com is set to be live, no later than mid-January - in time for the Craft and Hobby Association winter trade show. For more information, visit www.scraphd.com. Note: As a freelance journalist, I am sometimes provided with products to review. However, no products were exchanged for this story - just in case you (or the FTC) were worried about this detail. For the past few years, I've participated vicariously, and with different levels of involvement, a project known as One Little Word. Created in 2007 by Ali Edwards, a digital/paper/hybrid scrapbooker, author and life artist, the project is quite simple. Each year, Edwards decides on a word (or in some case words) that she is going focus on during the year. Ultmately, the word you choose (or chooses you) has the potential of making an impact upon your life. Since 2007, I've had six words impact my life. Typically I pick a word in January, that begins to shape my year. Then at some point, usually in the summer or early fall, a second word begins to emerge in my subconsious. There's no scientific pattern or method, but these are the words that have impacted my world in the last three years. So take a look at the glass pictured here. Is it half full or half empty? How you answer that question can make a world of difference. Be part of the second response for Haiti. Give with hope for a new day. 100% your gift to the Haiti Emergency will go to help the people of Haiti. * Want to Write a Check or Give Cash? Give through any local United Methodist Church. Checks should note UMCOR Haiti Emergency/Advance #418325 in the memo line. UMCOR is shipping health kits to provide basic necessities to people who have lost everything. Instructions for assembling and shipping health kits are online at www.umc.org/haitihealthkits. Kits are valued at approx. 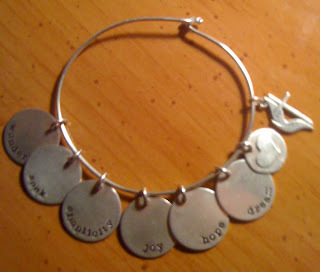 $12, and are distributed to those left without homes as a result of the earthquake (and other disasters). Note: If you are in NWA, the collection site is Elm Springs United Methodist Church. They are collecting completed kits through Wednesday, Jan. 27. You can also get the kits to me, by Tuesday, Jan. 26. There will be a great need for volunteers to help rebuild. Currently, it is not safe or possible for volunteers to go to Haiti. Those wishing to volunteer should contact their jurisdictional United Methodist Volunteers in Mission (UMVIM) coordinator about opportunities. Learn more at www.umvim.info. United Methodists everywhere are invited to share a prayer for those affected by the Haiti earthquake. Visit the Facebook group for 10thousanddoors.org (http://bit.ly/6oJb5U) to lift up your praise or concern on the wall. 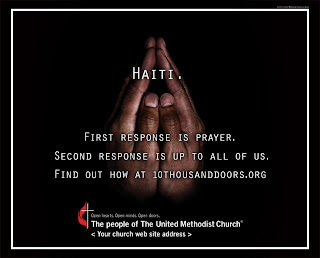 Visit http://www.umc.org/haiti and http://www.facebook.com/unitedmethodistchurch for continuously updated information. Then I ran across this quote that Amanda used on a recent post at www.kevinandamanda.com. "I work with a girl who absolutely loves Mondays. LOVES them. She says they give her a fresh start. Mondays that start a new month are even better. Sometimes we let our "failures" dictate how we move forward. But by realizing that every day - especially Monday - can be a "do-over" or "re-start" we can move forward. It's a new way to look at my favorite quote from Finding Nemo. As Dory put it, "just keep swimming." Some days, you can only keep swimming, moving forward or taking one step at a time. So, today is a New Week (yes it's Tuesday, but yesterday didn't count! ), and a new start. You may have already had a chance to see this, but it definitely brought a smile to my face on this cold and dreary day....enjoy! Editor's Note: Looking for a way to start 2010 off with a bang? Why not check out the newest release, by the writing team of Sara Evans (country music star) and Rachel Hauck: Sweet By & By, the first of the new Songbird series, published by Thomas Nelson. In honor of the release - set for this week, Hauck took time to answer a few questions about the novel. What happens when you combine a hippie mother, a daughter who has always tried to be the "responsible" one, a wedding in Tennessee and a whole cast of characters? The result is the newest release, Sweet By & By, by the writing team of Sara Evans and Rachel Hauck. The pair teamed up after the publishing house Thomas Nelson, approached Sara about doing a fiction project. "When she agreed, they paired me with her to write the story," Hauck said. "The partnership was a blend of Sara explaining what she loved in a story and what she wanted to see in the characters and me offering back ideas and character/plot developments." Hauck said it was fun and easy to work with Sara. "She's very down to earth and creative," Hauck said. "We pretty much agreed on everything!" The pair named multi-book series "Songbird," in part because of the appearance of a bird within the first two books. "I [also] suggested Songbird [as] a reference to Sara, a lovely and amazing singer," Hauck explained, "plus one of her most popular songs is 'Born to Fly.' It just absolutely described her and the story." The first novel focuses on the slightly dysfunctional relationship between Jade and her mother, Beryl, and is filled with a lot of drama and conflict. "Jade is a strong woman but gazing through life through the lens of heart ache," explained Hauck. "[She is] fixed but not whole. She wants love and stability." "She's selfish to the core, but fun and carefree, full of life, willing to challenge the norms." Hauck said the themes of conflict, found within the first novel, are relevant to today's society, although Jade and Beryl are purely fictional characters of their imaginations. Through out the novel, both Jade and Beryl have to face things they would rather forget. "We all have a past," Hauck said. "Many times, we bury issues - both good and bad - without acknowledging the impact on our lives. Many times it takes reckoning with the past to realize our future. That's what Jade and Beryl had to do." 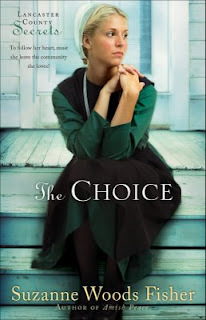 Hauck said they hope that readers will walk away, after reading the novel, realizing that "God is willing, able and loving enough to bring us through any situation and strengthen us. And that it's never wise to ignore the past. But deal with it in love and forgiveness." The next novel - a continuation of Jade's story (as well as Beryl's) is set for a January 2011 release. Jade's mother-in-law, June, will also take center stage in the drama. "Sara and I have to talk about the rest of the books, but I know for sure they will be exciting," Hauck said. When the book arrived in my mailbox, I was ready for an easy read. In a way, this novel fit that bill - the writing style of Evans and Hauck really flows. While it's an easy read, the book is filled with a variety of meaty topics. I'll admit, I had trouble putting the book down - and I definitely wasn't ready for the story to end. (Is it really going to be a whole year before I know what happens next?). I think, if you chose to pick up this book, you'll find a unique story that you will enjoy. Want to find the book on-line? The book is available from three on-line vendors: Barnes & Noble, Amazon.com, and Christian Book Distributors. Want to read more about Rachel and Sara? Check out Sara's website by clicking here. Visit Rachel's website by clicking here. Take Note: As a freelance journalist, I was provided a copy of this book by Rachel Hauck. This review was not influenced by a free book - just in case you (or the FTC) were worried about this detail. I just found out today that a devo (devotion) that I wrote in late 2009, will be published in the July/August 2010 issue of DevoZine. DevoZine is the teen devotional magazine published by the Upper Room. I'm so excited, because DevoZine is one of the first places that I published with (back in the mid-90s), as I moved into the Christian publishing world. In 2009, I had two "working" words - hope and dream. My goal was to learn to "hope" again, and to "dream" impossible dreams - that only God could help turn into a reality. In a way, the letter I received today in the mail, was a bit of a confirmation - that it's o.k. to hope and dream again. It's small, but I'm writing & creating again. Here's a wish for everyone in "my" corner of the world to have a happy, healthy and hope-filled new year. May 2010 be a year filled with dreams, wishes and new realities. Nearly 1,000 people entered the contest to win the pearl necklace - amazing! We're excited to announce that Carol from Carol's Notebook won the necklace! Carol left a comment on Freda Man's blog! Also, we'll be giving away five copies of the Pearl Girls book this week on the Pearl Girls' blog. All you need to do to be entered is leave a comment before 1/8/10. The winner was chosen using random number integer.com.